We're thrilled to have Elana K. Arnold join us to chat about her latest novel, DAMSEL. Elana, how long did you work on DAMSEL? I tend to write a draft of a book in a season—about three to four months—and then revise in various passes over the next three to six months. DAMSEL was birthed after such a nine-month gestation. It helps me to focus solely on the art of writing first, which to me means allowing the back of my brain to plant seeds, go in directions I can’t anticipate, and allow myself to be as honest and tender on the page as possible, without thinking about who may one day read the book or what they might think. Art first, always. Later comes craft—shaping the book into its final form through considering questions of theme, tension, plotting, pacing, by dialing up or back various aspects of the book to help readers feel what I feel. After art and after craft comes business—who will read the book? How will I get it into their hands? Art, then craft, then business. I love this question, because I believe that this is the whole reason I write—to learn more about the world, humanity, myself, and the art and craft of writing through the creation of the book. DAMSEL taught me about how wonderful creative constraints can be. In this case, I decided that the book would be made of seven sections, each with seven chapters. DAMSEL is an original fairy tale, and seven is a magical number, so this seemed like a wise constraint to place. Another constraint I created was that each chapter should be named in a similar fashion—for example, the first chapter of the first section is titled “The Dragon’s Blame,” and the seventh chapter of the second section is titled, “Ama’s Sorrow.” This parallel construction, along with the seven sections of seven chapters, form a structure for the story to live inside, and the story structure reflects the structure of the fictional world that the damsel inhabits—a world full of unspoken rules, rigidity, form, constraint, and tension. I am working on another fairy tale inspired novel, this one set in a contemporary world. Also, it has werewolves. ELANA K. ARNOLD writes books for and about children and teens. She holds a master’s degree in Creative Writing/Fiction from the University of California, Davis where she has taught Creative Writing and Adolescent Literature. Her most recent YA novel, WHAT GIRLS ARE MADE OF, was a finalist for the National Book Award, and her middle grade novel, A BOY CALLED BAT, is a Junior Library Guild Selection. A parent and educator living in Huntington Beach, California, Elana is a frequent speaker at schools, libraries, and writers’ conferences. Currently, Elana is the caretaker of seven pets, only three of which have fur. 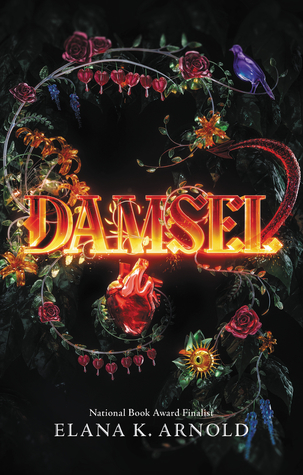 Have you had a chance to read DAMSEL yet? Do you allow the back of your brain to plant seeds? Do you put constraints on the way you tell a story? Share your thoughts about the interview in the comments!